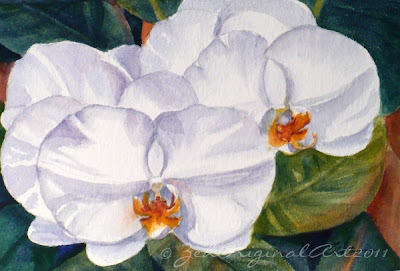 The orchid paintings of my Tropicals Collection focuses on the beautiful flowers on the island of Oahu. Some of the flowers such as these orchids, I found in the Foster Botanical Gardens in Honolulu. Oahu has five botanical gardens I believe, but we only managed to get to one of them. Still it was a full day of gorgeousness. I loved finding beautiful orchids blooming outdoors. Hawaii is a tropical paradise! "White Orchids" original watercolor is sold. Find my available orchid paintings in my shop here: Orchid watercolor paintings.